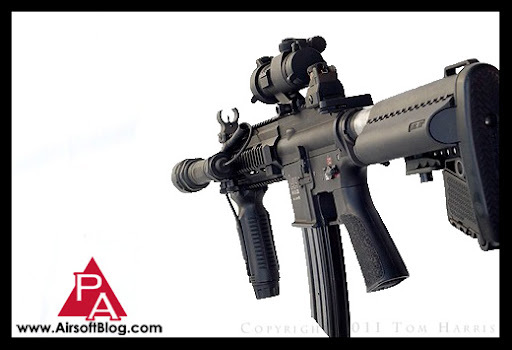 Pyramyd Airsoft Blog: The Grand Finale, Part II of II: Stick a Fork in the VFC HK416 CQB Cuz It's Done!!! 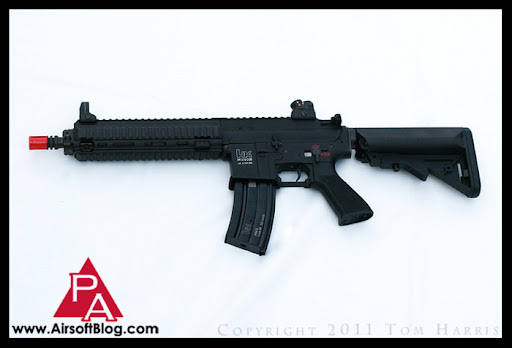 The Grand Finale, Part II of II: Stick a Fork in the VFC HK416 CQB Cuz It's Done!!! Well, I guess for those of you who stuck around through this entire process, you may now give yourself a gold star. We've made it. We're done. The VFC HK416 CQB is complete. It's tuned, toned and ready to send some BBs down range very accurately, and in rapid succession. - TSD JB Unicorn (JBU) 6.03mm Tight Bore Inner Barrel (Custom Length). It began as the 363mm-length JBU 6.03mm Tight Bore Barrel, but I "nipped the tip" to bring the Cylinder to Inner Barrel Volume Ratio closer to ideal, which is generally around a 2:1 ratio. - Stock VFC Hop-Up Bucking, Soft-Type. You'll recall in an earlier post that I sealed up the bucking/inner barrel with Teflon tape to prevent air loss. - PCS Hop-Up Nub for increased accuracy on a consistent basis. - Stock VFC Air Seal Nozzle. I applied an ever-so-small amount of silicone grease to the tiny o-ring seal inside the air nozzle. - Modified Stock VFC Cylinder Head. I didn't document this step, but I cut out a thin (aprx. 3/16" thick) piece of foam padding made by 3M to not only improve the piston's angle of engagement, but also to deaden the slapping sound that the piston makes when it hits the cylinder head. The sound changed from a higher-pitched slap to a slightly lower-pitched thump when the piston hit the pad. I am currently writing a separate illustrative tutorial on this step in the next few weeks. - Stock VFC Ported Cylinder. I applied a very thin layer of silicone grease inside the cylinder head to reduce friction between it and the piston head o-ring seal. - Stock VFC Aluminum Piston Head with Bearings. This was not the ideal part for this specific setup, but I kept it because I didn't have a spare polycarb head with bearings available and I wanted one that had the bearings to prevent the spring from getting torqued and twisted. The reason it's not the ideal piston head for this specific set up is because I'm using a relatively light spring and using an aluminum piston head adds extra weight to the piston, which makes it heavier for the spring to push, resulting in a reduction in the overall velocity or power of the rifle. But as I said in yesterday's video, this is a CQB weapon and does not need a lot of power so I'm not going to lose any sleep over any FPS I may have lost from the aluminum piston head's use. - Modified Stock VFC Clear Piston. As documented earlier, I busted out my Dremel and removed about half of the third tooth. VFC did me the favor of removing the entire 2nd tooth, which I thought was delightful of them to do. This mod is directly associated with adjusting the angle of engagement. You MUST remove these teeth. Otherwise, plan on buying a new piston each after you pull the trigger once or twice. - JBU M120 AEG Spring. Also pulled this from TSD JB Unicorn (JBU) M120 Upgrade/Tune-Up Kit I had lying around in order to put a little extra stank on the BBs. Make sure to insert this into the end of the spring with the tighter coils. - Stock VFC Standard Ratio Metal Gears. Applied a reasonable (don't over-do it) amount of White Lithium Grease with polytetrafluoroethylene (aka PTFE aka Teflon). Do NOT use White Lithium Grease inside your AEG cylinder or on other parts that come in contact with rubber o-ring seals. The gears and the piston/cylinder are two different systems. Here's a little factoid about this Teflon/PTFE stuff I keep mentioning: When used as a lubricant, PTFE has one of the lowest coefficients of friction against any solid. Hot knowledge has been dropped. Right on your chest. You're welcome. 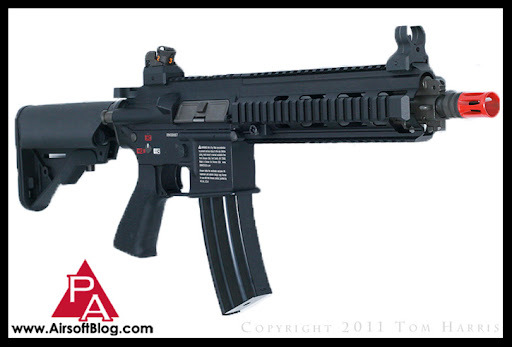 - Stock VFC Red AEG Motor. Gives a decent trigger response and when used in conjunction with an 11.1v Li-Po battery, it does not have any trouble pulling back that JBU M120 spring I installed. - Stock High-Quality, 18 awg Wiring. The wiring that VFC used appears to be pretty good quality just based on a visual inspection, though I'm certainly no authority on that here. My only complaint is that its quite stiff (twss) and can be cumbersome when dealing with your battery in the buffer tube & how that affects the adjustable stock's ability to retract into 1st position. - The Adjustable Stock - Classic Army Adjustable VLTOR-Style Stock. Watch the video. I explain myself there. While Pyramyd Air does not technically have this item listed for sale on their website, they are a Classic Army dealer and I'd bet a solid $2.69 that if you called them up at 888-262-GUNS (4867) and spoke with one of their sales representatives, you could probably get them to special order it for you if you used words & phrases like, "Please," "Thank you" and "Pyramyd Air Rocks My Socks." They really love it when you say that last one. - The Buffer Tube - I simply modified the one that originally came with the HK416. As I also mentioned in the last video, I used a wire brush Dremel bit (along with the Dremel itself) and removed the black coating from the buffer tube that came on the HK416 in an attempt to give it a stainless steel look. I think it's a cool look if done right. This was my first-ever attempt at doing this, so I can't say that I'm completely 100% satisfied with how it turned out (remember: the author is a perfectionist), but I still think it turned out pretty well, all things considered, so I'll give it a 94%, which is still a pretty solid A in school. - The Torch - UTG ZL337 Weapon-mount & Handheld Tactical Xenon Flashlight "Win" Package. Since my HK416 has been set up as a Close-Quarter Battle weapon, and generally speaking, close-quarter battles are generally conducted in doors where vision can be impaired by the lack of sufficient lighting, I mounted a UTG ZL337 Xenon Tac light on the rail system and attached the remote pressure switch pad to the vertical fore-grip. Clocking in at a measly $49.99 for everything included in the package, this thing is an insane deal! It's hard to justify the large premium you would have to pay for the equivalent products specs and accessory package from Surefire or some of the other well-known real steel brands when Pyramyd Air has the UTG option available. Bottom line, this thing is uber sick and uber L337. Cheesy, I know, but I still feel clever. So shut it. This thing not only feels great in the hands of the operator (twss), it's got a couple nice features to it, one of which is that on each side of the finger-molded grip, there is a panel that slides out so that you can replace it with the remote pressure switch of your favorite weapon-mounted tac light (e.g. the UTG ZL337 I just mentioned). 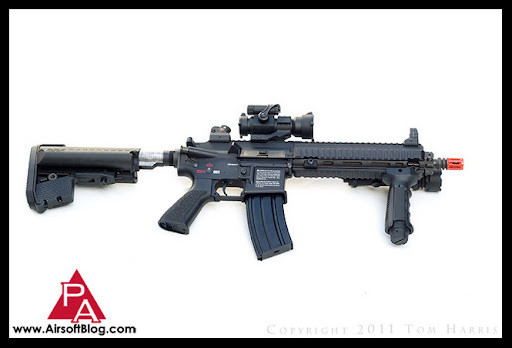 - The Optics: I decided to go with the TSD JB Int'l Aimpoint-Style Red & Green Dot Sight on this one. Yet another great bargain here between olid metal body casing, the red and green dot reticles are adjustable, allowing you to zero in your sight, and it COMES WITH THE RAIL MOUNT & tiny battery so you can enjoy this baby right out of the box. Throw it on your gun and go shoot somebody*!!! *This assumes that "somebody" is not only on an approved Airsoft field, but that they are wearing proper, ANSI-rated eye-protection. You probably shouldn't shoot them if you're just in the parking lot hanging out, either, but that's more of a courtesy issue and can be disregarded if the situation calls for it. 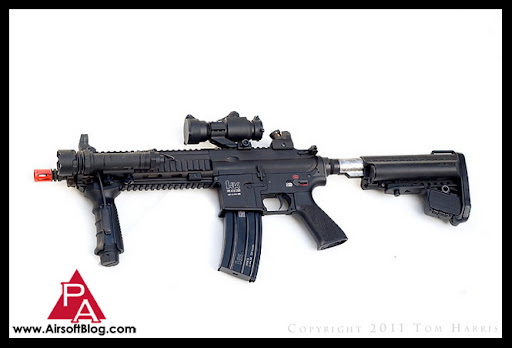 So, all in all, you'd be pretty dumb if you attempt to convince me that the VFC HK416 CQB isn't the Airsoft shizzle. Not just because I upgraded it, but because I upgraded it well. Quite frankly though, I only upgraded it because I'm a perfectionist. It really doesn't need much work at all to be a great gun. Other than a little Teflon tape here and there, which you should do to just about every Airsoft gun you own (except if you're lucky enough to own a gun from a certain extreme custom Airsoft sniper rifle builder I know), the VFC HK416 CQB is one of the few Airsoft AEGs that I've either seen and/or had first-hand experience with that is pretty much solid right out of the box. I give this gun a solid "two trigger-finger" rating, as in, "I want one HK416 for each of my two trigger fingers." That's the best ration you can get. If you couldn't gather this from all my ravings over the last several blog posts, you're an idiot. Slap yourself. If you're NOT an idiot, buy this gun. Use it on the Airsoft field and stare it while you're alone in your parent's basement. Be sure to take lots of photos of it and post them on the Airsoft Retreat forums for others to enjoy. Some call that Airsoft Vanity, I call it Bragging Rights. It's the right thing to do. Just for good measure, to really drive it home, here's one last shot of the VFC HK416 CQB, this time with a non-functional***, MOCK suppressor attached. ***Non-functional, as in, no foam or ports inside that will dampen the sound of a portable firearm, as defined by the BATFE. Mmmmmmm. I don't know about you, but that right there really does it for me. Even my 5.11 backpack wants to be near it. Alright. It's over. Now onto other amazing Airsoft things. Stay tuned.